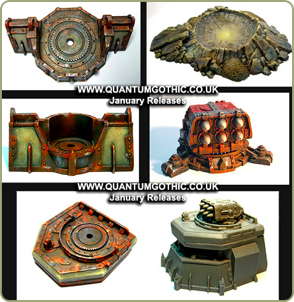 Quantum Gothic have sent details their January 2011 releases. From their announcement: Crater 87 : We'll be starting a dedicated range on 'rubble and craters' to complement our existing scenery kits. This first 'large' Crater ( L205xD155mm - crater diameter 87mm ) is now ready available at a price of £11.40. Bunker Top V2 : An upgrade to our existing Armored Bunker kit which allows to mount our regular artillery kits ( Q_Cannon, Catalyst, Dish and our latest Sentry Rocket V1 - all sold separately ). The kit is sold on its own at a price of £8.40 or complete with Bunker ( Armoured Bunker V2 ) at a price of £20.40. Wall Emplacement : This brand new Armored Wall section ( 101mm in Lenght ) will help you integrate our artillery pieces to the rest of the Wall structure. Q_Cannon, Catalyst, Dish ( sold separately ) and our future (regular) artillery kits can now more efficiently be part of this defense line structure giving a unique and practical visual kick to any sci-fi battlefields. Now available at a price of £6.40. Sentry Wall : A brand new Armored Wall section ( 77mm in Lenght ) allowing you to integrate our Sentry Guns ( sold separately ) to our Wall structure. Place it nearby a Gate or at regular intervals along the Wall perimeter to upgrade your defense lines. Available at a price of £4.60 Sentry Rocket V1 : A 'six pack' Automated Racket/Missile Launcher. Intended to boost our range of Sentry Guns, in fact this is the first of a higher level of automated gun-platforms which uses the same platform type/host used for our artillery kits. Now available at a price of £10.40.